In 2017, Italy imposed a low flat tax for new residents in hopes of attracting wealthy people, but interest in the program has been limited. Silvio Berlusconi, the former prime minister of Italy who was convicted of tax fraud, is proposing a flat tax country-wide. An Italian general election will take place on Sunday, March 4. Rich people can be a boon to the economy – and Italy is hoping to cash in. Last year, Italy unveiled a policy measure to attract super wealthy people to move to the Mediterranean country. Under the program, anyone who moves to Italy is able to pay a flat tax of 100,000 euros ($US123,000) a year, regardless of their income, according to Bloomberg. That amount is a fraction of the tax paid by wealthy Americans, even after the new tax bill was passed. In the US, someone who makes $US10,000,000 a year would likely pay more than $US3,000,000 in taxes. When the budget plan was passed, officials expected at least 1,000 people to immediately sign up for the program, Yahoo Finance reported. Actual progress has been much slower. Fabrizio Pagani, head of Italy’s office of the Minister of Economy and Finance, said about 150 people have made inquiries regarding the policy. 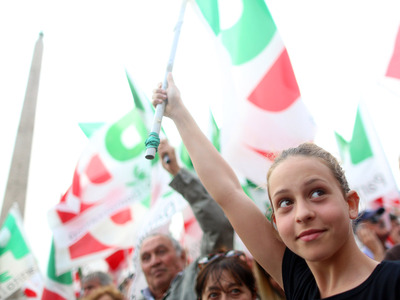 It’s possible that some of the interested wealthy people may be waiting to find out what happens on Sunday, March 4, when the next general election will take place in Italy. A new flat tax rate for all Italians – not just uber wealthy expats – is one of the main issues on the agenda for the Italian general election. Unlike a progressive tax system, which taxes high earners at a higher rate, a flat tax charges the same tax rate for all people, regardless of income. Former Italian Prime Minister Silvio Berlusconi – who refers to himself as “the Jesus Christ of politics” – wants to enact a flat tax plan for the entire country. Berlusconi is the leader of the Forza Italia party, a right-center coalition that is one of the four big players in Sunday’s election. Berlusconi wants to install a flat tax rate for every Italian, in part to shield against tax evasion. He’s proposing a flat tax rate of 23% – which is the current minimum rate, while some people now pay as much as 43%. Berlusconi is worth upwards of $US8 billion, according to Forbes, making him the fifth wealthiest Italian. A friend of Vladimir Putin and a noted philanderer, Berlusconi lost official power in 2013 when he was removed from the Senate and convicted of tax fraud. Berlusconi has supported a flat tax since the first of his three stints as prime minister in 1994, but was never able to enact tax reform. Berlusconi and other populist politicians “echo arguments that if the tax system were simplified people and companies would more readily pay up while keeping more cash to buy goods or make investments,” reports The Wall Street Journal. That reasoning is similar to the flat tax policy currently offered to wealthy individuals who relocate to Italy. Italy is 2.3 trillion euros ($US2.8 trillion) in debt, reports Bloomberg, second only to Greece in the Eurozone. The Bruno Leoni Institute (BLI) worries that a flat tax would create a shortfall of budget revenue and necessitate large spending cuts. The populist Five Star Movement and the currently in power Democratic Party – two of the major parties fighting in the election – oppose a flat tax rate but do support tax cuts, The Wall Street Journal reports. A flat tax “would be a masterpiece of redistribution from the poor to the rich,” said Luigi Marratin, economic advisor to current Prime Minister Paolo Gentiloni. The most likely outcome in Sunday’s election is a hung parliament, according to HSBC, which could lead to another election. Berlusconi’s centre-right coalition will likely be the biggest bloc, but will fall short of having enough seats in both houses of the Italian parliament to govern.